A scene from a suicide prevention video which was a collaborative effort between the Gallia County Sheriff’s Office and Gallia Prosecuting Attorney’s Office, features comments from community members. Pictured speaking in the video is Sheriff Matt Champlin. 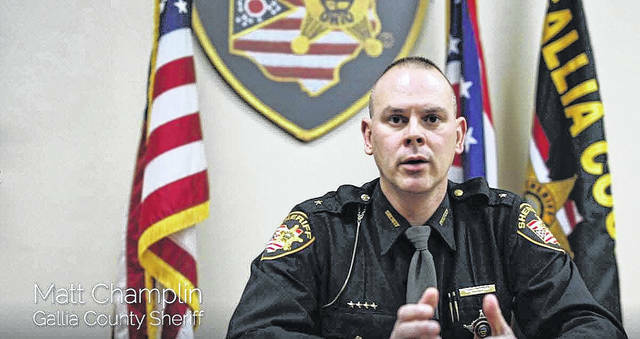 GALLIPOLIS — The Gallia County Sheriff’s Office and Gallia County Prosecuting Attorney’s Office have extended a hand to anyone who is struggling with mental and emotional distress. Suicide has become more and more frequent in our area, an unfortunate reality of Prosecutor Jason Holdren and Sheriff Matt Champlin’s work. Champlin and Holdren worked together to make a video targeted towards individuals struggling with suicide. The video features members of the community from local schools, churches, and other institutions that offer help and support for those struggling with self-harm. “I felt like, in the position we’re in now, we are given certain opportunities to be able to speak out and address situations with people that we have a passion to address and to try to reach the citizens that we serve in a manner to provide them with the help that they need,” said Champlin. “We felt like this video was a mechanism to reach people who may be going through some trying times, this was a mechanism that we could reach a lot of people quickly and share a simple message and be an outlet for somebody that might need some help,” said Champlin. The video has been shared nearly 500 times on the Gallia County Sheriff’s Facebook page and viewed over 16,000 times. The video offers resources and individuals from the community that are willing to help. “We knew that it was important to reach out to every school in the county to find that person that everyone in that school will know, that if someone in that school sees that person they know, hey, maybe that’s somebody I can reach out to,” said Holdren. The video ends with numbers that anyone can call or text for help if they feel the need to. Text 741741 or call 1-800-252-5554 to talk with a crisis counselor. “This has been something that has been laid on both of our hearts that we needed to find a way to speak out and address the situation,” said Champlin. While Holdren and Champlin understand that they are not readily accessible to the entire community all of the time, everyone knows someone that can help them through a difficult time. Both Holdren and Champlin encourage anyone to reach out to members of the community to share their difficulties. “If we, by producing and sharing this video save one person then it was worth every minute and dollar spend to do it. Our goal is to impact lives positively, and change the overall environment in Gallia County,” said Champlin.